Bruce Williams owns Lakeside Farm Inc., a farming and timber business in Virginia and North Carolina, and is a veteran Farmer-to-Farmer volunteer who has worked with the program since 1995. He is also the President and owner of Agronomy and Horticulture Services, L.L.C., which leads pesticide safety recertification and training programs. Bruce recently sat down with CNFA’s F2F Country Director for Mozambique, Antonio Aljofre, to speak about the impact and future of the Farmer-to-Farmer program. Bruce Williams: Hi Antonio, how are you? Glad to hear you are visiting stateside. Is this the first time you have been to Washington D.C.? Antonio Aljofre: Yes, it’s my first time to U.S. It has been a great opportunity to meet our colleagues and see how things are moving here in the U.S.
BW: Oh wow, yes, it’s quite impressive up there to see all the museums. I hope you’re getting time to get around to see some of the sights. AA: Yeah, well time has been very busy, but I have seen some incredible things so far. 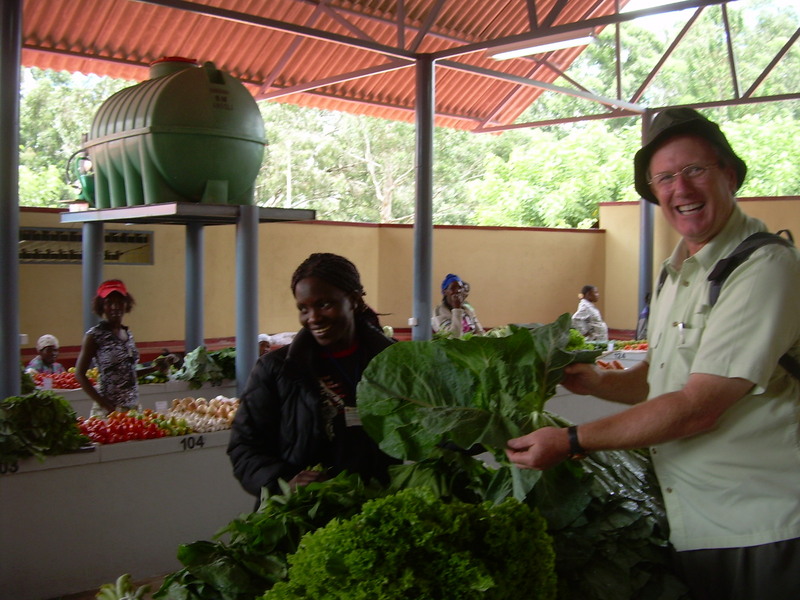 As you know, in Mozambique, you worked with very smallholder farmers. I was able to meet some smallholder farmers in the U.S., and they were totally different. BW: Oh, yes, it’s a different world altogether. AA: So let’s get started, how has your experience been volunteering with Farmer-to-Farmer? I know that you have been not just to Mozambique, but to Bolivia, Moldova, and Nepal, among others, and most recently completed an intensive pesticide assignment in Angola. BW: Yeah, that was a lot of work but I enjoyed it. I learned a lot – it has been very beneficial because I get to learn new things, learn about new people. I almost feel guilty because I usually learn a lot more on these trips than what I give. I see all sorts of new insects and plant diseases, and I learn a lot about people and about culture. All of the assignments are fun, some of them are more work, but the common thread is that they are all interesting. AA: Everyone here recognizes that you have been a successful F2F volunteer. In your opinion, what makes a good volunteer? BW: I think flexibility is key – being flexible about just about everything, from trying new foods to experiencing a new culture is important. It’s also important to be open to new things. To me, those are the two main attributes. I don’t think it’s just about your knowledge, I think it’s an ability to recognize what is needed and be able to tailor your assignment to help deliver on that need. AA: What do you think makes a good assignment? BW: That’s a tough one, because some of my best assignments have been difficult. I enjoy them all, but I think I like to have a little structure in them. I think structure is important. The people make the assignment more than the assignment content. I have had some very difficult assignments, but really great people to work with. However, I think structure helps and having details about what is going to be covered such as goals and objectives. The key is to have something to start with that you can then work towards. AA: What do you think makes F2F unique? BW: I think the main thing is that you are working with people directly. You aren’t necessarily working with academic institutions; you are working with people in the countries, on the ground, just regular folks. It goes both ways; you are working with regular folks from the U.S. and regular folks in the field, and that’s what makes it unique. "On a Farmer-to-Farmer assignment, you are working directly with people trying to make a living through agriculture, trying to feed their families." AA: What do you hope for the future of Farmer-to-Farmer? BW: I guess I am pretty selfish. I enjoy Farmer-to-Farmer because it helps me grow as a person; I enjoy the adventure of it. I enjoy solving problems and helping people. AA: But of course, you taught people how to increase production through saving seeds and incremental planting. The impacts of your assignments are great, from introducing methods of cost saving for seeds, to helping establish incremental planting to meet the needs of the market. You came in to work with a group in Mozambique that had no prior experience with establishing plant beds or using fertilization. You took this group, and helped them establish a small demonstration garden for a hands-on approach to transfer skills to the participants. They were able to really learn effective strategies due to your teachings. Your assignments are an incredible experience because you really are a participatory teacher. BW: Yeah, I appreciate that. Mozambique is a really interesting place. I enjoyed my assignment there very much. I use the pictures that I took there in my seminars, I have a slide montage and show pictures of places I have been. People are always asking me questions about Farmer-to-Farmer, and what’s involved in being a volunteer, so I try to spread the word about that. AA: Yeah, you are our ambassadors. It’s good when the word comes from someone who has been in direct contact with the farmers. Well, Bruce, thank you for your time, and for your volunteer service, it is much appreciated and the benefits are enormous. We hope to see you again in Mozambique. Farmer-to-Farmer volunteers focus on building sustainability and strengthening organizational capacity by providing technical assistance during impactful short-term assignments. Volunteers like Bruce exemplify the spirit of the program – recognizing that a little flexibility and cultural understanding goes a long way towards achieving high-impact, positive results for smallholder farmers. By acting as ambassadors for the United States, volunteers project the shared American spirit of volunteerism, and upon return, provide a cross-cultural exchange which transcends nationality. F2F is directly responsible for improving livelihoods through practical, effective assignments: supporting small business owners with the marketing skills they need to thrive, training small-holder farmers on effective and safe pest management techniques, and working with cooperatives to successfully manage their operations. CNFA is proud of the efforts of its volunteers and the strides that have been made with this high-impact program, and looks forward to the future of Farmer-to-Farmer. Visit CNFA’s website to hear more from Bruce, and to learn how to become a volunteer.